University Associates-Silicon Valley LLC (UA-SV) has selected TMG Partners and the Related Companies as the master-developer team for a 77-acre sustainable community for education and research at the NASA Research Park (NRP) in Moffett Field. 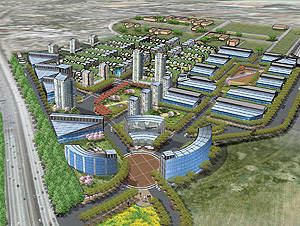 UA-SV, established by the University of California, Santa Cruz, and Foothill-De Anza Community College District (FHDACCD) to further their educational, scientific, and public purposes in Silicon Valley, signed a 95-year ground lease for the NRP university development area with NASA Ames Research Center in December, 2008. The goal of this public-private partnership, which was announced on March 13, 2009, is to create an integrated educational and research community featuring classrooms and laboratories, sustainable housing, and room for entrepreneurial partnerships. The new community will be comprised of approximately 3 million square feet of residential and non-residential development. It will, in conjunction with adjacent NASA research facilities, serve as a test-bed for advances in green technologies and provide an environment that nurtures innovation, entrepreneurship and sustainability. UA-SV is very pleased with the selection of TMG Partners and the Related Companies, two highly successful companies with particular expertise in mixed-use development, as partners in this exciting new development. TMG/Related and UA-SV will enter into an exclusive negotiating agreement that specifies the business terms of their relationship through pre-development activities, which include master planning and completing site entitlements in conformance with the California Environmental Quality Act (CEQA). UCSC Chancellor George Blumenthal, chair of the UA-SV board, said the board "is enthusiastic about working with TMG/Related as we bring this exciting, green project to fruition. They bring outstanding credentials, expertise, and financial strength with a commitment to the future vitality of this region. I am confident TMG/Related will position this project to meet the educational and research needs we value so highly." NASA Ames Center Director S. Pete Worden said: "The University Associates-Silicon Valley selection of TMG/Related is a critical step in advancing our partnership to develop part of the NASA Research Park with a consortium of universities led by UCSC. The UA-SV development will assist NASA with R&D and science, technology, engineering and math (STEM) education and help us bring forth new ideas in both education and technology to address the great challenges facing our nation." Mike Brandy, interim Chancellor of Foothill-De Anza Community College District, stated: "We are excited to see this development move forward with the selection of TMG/Related. The new community being planned at NASA Research Park promises to build on Silicon Valley's reputation as a leader in creative thinking and environmental stewardship. It will advance and augment the most critical element of the Valley's success--the investment in education." William Berry, president and CEO of UA-SV, stated: "The selection of TMG/Related, two highly regarded, well-established development companies, demonstrates the considerable attractiveness of this project, even in a tough economy. We are looking forward to working with TMG/Related to fulfill the vision of this development as a highly innovative regional education and resource center." On receiving the news of the selection of TMG, Michael Covarrubias, chairman and CEO of TMG, said: "TMG and Related are honored to have been selected to partner with UA-SV on this development. The opportunity to lead the master development of this three-million-square-foot, mixed-use campus on behalf of NASA Ames and University Associates-Silicon Valley is extraordinary. A new community integrating the commercial, science and residential components with technology companies of Silicon Valley can be found nowhere else." "The master plan to add a residential and retail community to this consortium presents the opportunity to create a true community, not just a series of buildings," added William Witte, president of the Related Companies California. "This has the potential to become a model for sustainable development."